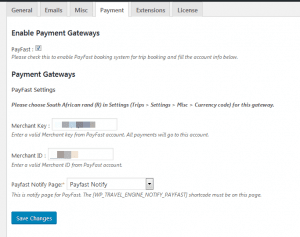 PayFast Payment Gateway is an extension for WP Travel Engine that allows you to accept trip and tour payments via one of South Africa’s popular merchant service, PayFast. PayFast Payment Gateway requires WP Travel Engine plugin installed. Payment from any country can be accepted, as long as you use ZAR as the currency. To configure PayFast Payment Gateway, go to Trips > Settings > Payments. PayFast Notify Page – PayFast Notify Page is created during the plugin activation. It is the notify page for PayFast. To configure ZAR as the currency, go to Trips > Settings > Misc and choose South African Rand (R) as the Currency code. Later, when a traveler books a trip via PayFast Payment Gateway, the traveler is taken to PayFast to make a secure payment.